We provide a variety of printing services including: commercial printing, printed and embroidered apparel, promotional products, graphic design, direct mail services, and on site consultation services. Our service region includes Pittsburgh, State College, Altoona, Johnstown, Somerset, and everywhere in between. Since 1952, Damin Printing Company has been satisfying the printing needs of private, non-profit, commercial and industrial organizations. In May of 1952, Dean Damin purchased Lintz Printing from William Lintz and Damin Printing Company was founded. We are a three generation, family owned and operated, commercial printing company serving customers across Western Pennsylvania as well as several customers along the East Coast. Over 60 years later, one thing that remains the same is our passion for printing. Our staff has over 150 years of combined experience in the commercial printing industry. 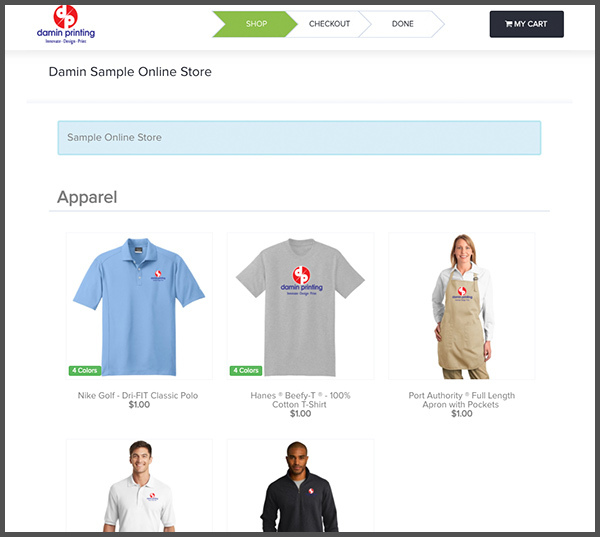 Damin Printing offers online stores to our clients allowing you the ability to sell your apparel to a larger audience while saving your time and money. Please contact us today for more information about this exciting opportunity to provide a custom experience for your corporation, sports team or non-profit. Let our experts come to you to discuss your project. Our in-house creative department provides design services from concept to finished piece. We offer traditional commercial printing and the latest digital printing technologies. Whatever the product-from postcard mailers, newsletters, or brochures to logo wear and promotional items-Damin Printing delivers a quality product at a great price on time. Without exception. And their responsiveness and customer service are exceptional, whether it’s a small job or a large expenditure. Working with your company has great results for our company. The variety and selection of so many things has made Damin a one stop shop for advertising needs. The sales staff is especially helpful with design ideas to delivery of the final product. We have worked with Damin Printing to create many advertising pieces and marketing items throughout the last five years. Damin’s has consistently gone above and beyond in helping us streamline our ideas and create products that we are proud to share. The patience, friendliness, and efficiency that Damin’s provides has consistently exceeded our expectations. Furthermore, the personalized attention we have experienced sincerely makes us feel valued as a customer. We highly recommend Damin Printing to anyone seeking a printing company that is easy-to-work with throughout the daunting task of creating quality, eye-catching items! We offer an extensive variety of promotional products and business gifts to fulfill all of your branding needs. Let us design, print and mail your postcards, newsletters and brochures for you. We can provide you with T-shirts, hats, polo shirts and more for your organization or event. We Guarantee a No-Hassle, No-Obligation, Pain-Free Quote!